Home > Services > Arthroscopy of the Knee JointThe arthroscope is a fiber-optic telescope that can be inserted into a joint (commonly the knee, shoulder and ankle) to evaluate and treat a number of conditions. A camera is attached to the arthroscope and the picture is visualized on a TV monitor. Most arthroscopic surgery is performed as day surgery and is usually done under general anesthesia. Knee arthroscopy is common, and millions of procedures are performed each year around the world.Arthroscopy is useful in evaluating and treating the following conditionsTorn floating cartilage (meniscus): The cartilage is trimmed to a stable rim or occasionally repairedTorn surface (articular) cartilageRemoval of loose bodies (cartilage or bone that has broken off) and cystsReconstruction of the Anterior Cruciate ligamentPatello-femoral (knee-cap) disordersWashout of infected kneesGeneral diagnostic purposesBasic Knee AnatomyThe knee is the largest joint in the body. The knee joint is made up of the femur, tibia and patella (knee cap). All these bones are lined with articular (surface) cartilage. This articular cartilage acts like a shock absorber and allows a smooth low friction surface for the knee to move on. Between the tibia and femur lie two floating cartilages called menisci. The medial (inner) meniscus and the lateral (outer) meniscus rest on the tibial surface cartilage and are mobile. The menisci also act as shock absorbers and stabilizers. The knee is stabilized by ligaments that are both in and outside the joint. The medial and lateral collateral ligaments support the knee from excessive side-to-side movement. The (internal) anterior and posterior cruciate ligaments support the knee from buckling and giving way. The knee joint is surrounded by a capsule (envelope) that produces a small amount of synovial (lubrication) fluid to help with smooth motion. Thigh muscles are important secondary knee stabilizers.InvestigationsA routine X-Ray of the knee, which includes a standing weight-bearing view is usually required. An MRI scan which looks at the cartilages and soft tissues may be needed if the diagnosis is unclear. There is little value in the use of Ultrasound in investigating knee problems.Meniscal Cartilage TearsFollowing a twisting type of injury the medial (or lateral) meniscus can tear. This results either from a sporting injury or may occur from a simple twisting injury when getting out of a chair or standing from a squatting position. Our cartilages become a little brittle as we get older and therefore can tear a little easier. The symptoms of a torn cartilage includePain over the torn area i.e. inner or outer side of the kneeKnee swellingReduced motionLocking if the cartilage gets caught between the femur a tibiaCartilage TearsOnce a meniscal cartilage has torn it will not heal unless it is a very small tear that is near the capsule of the joint. Once the cartilage has torn it predisposes the knee to develop osteoarthritis (wear and tear) in 15 to 20 years. It is better to remove torn pieces from the knee if the knee is symptomatic.Torn cartilages in general continue to cause symptoms of discomfort, pain and swelling until the loose, ragged pieces are removed. Only the torn section is removed and the knee should recover and become symptom free. If the entire meniscus is removed, the knee will develop osteoarthritis in 15 to 20 years. It is standard to remove only the torn section of cartilage in the hope that this will delay the onset of long-term wear and tear osteoarthritis.Occasionally, provided the knee is stable and the tear is a certain type of tear in a young patient (peripheral bucket handle tear), the meniscus may be suitable for repair. If repaired, one has to avoid sports for a minimum of three months.Articular Cartilage (Surface) InjuryIf the surface cartilage is torn, this is most significant as a major shock-absorbing function is compromised. Large pieces of articular cartilage can float in the knee (sometimes with bone attached) and this causes locking of the joint and can cause further deterioration due to the loose bodies floating around the knee causing further wear and tear. Most surface cartilage wear will ultimately lead to osteoarthritis. Mechanical symptoms of pain and swelling due to cartilage peeling off can be helped with arthroscopic surgery. The surgery smoothes the edges of the surface cartilage and removes loose bodies.Anterior Cruciate Ligament InjuriesRupture of the Anterior (rarely the posterior) Cruciate Ligament (ACL) is a common sporting injury. Once ruptured the ACL does not heal and usually causes knee instability and the inability to return to normal sporting activities. An ACL reconstruction is required and a new ligament is fashioned to replace the ruptured ligament. This procedure is performed using the arthroscope.Patella (knee-cap) DisordersThe arthroscope can be used to treat problems relating to kneecap disorders, particularly mal-tracking and significant surface cartilage tears. Patients may need to stay overnight if a lateral release has been performed as knee swelling is quite common. The majority of common kneecap problems can be treated with physical therapy and rehabilitation.Inflammatory ArthritisOccasionally arthroscopy is used in inflammatory conditions (e.g. Rheumatoid Arthritis) to help reduce the amount of inflamed synovium (joint lining) that is producing excess joint fluid. This procedure is called a synovectomy. After the surgery a drain is inserted into the knee and patients generally require one or two nights in hospital.Bakers CystsBakers cysts or popliteal cysts are often found on clinical examination and ultrasound / MRI scan. The cyst is a fluid filled cavity behind the knee and in adults arises from a torn meniscus or worn articular cartilage in the knee. These cysts usually do not require removal as treating the cause (torn knee cartilage) will in most cases reduce the size of the cyst. Occasionally the cysts rupture and can cause calf pain. The cysts are not dangerous and do not require treatment if the knee is asymptomatic.New TechnologyIsolated areas of articular cartilage loss can be repaired using cartilage transplant technology. This is a new and exciting field that is developing in the treatment of specific isolated cartilage defects in younger patientsThe process is called Autologous Chondrocyte Grafting . It involves harvesting cartilage cells from the affected knee, sending these cells to a laboratory and then culturing the cells to multiply into many cells. The large amount of cells produced are then placed back into the affected knee into the defect requiring resurfacing. Results are still short-term follow-up but are looking encouraging.After a major cartilage or ligament injury has been treated the knee can return to normal function. There is however a small increase in the risk of developing long-term wear and tear (Osteoarthritis) and depending on the degree of injury activity modification may be required. Activities that help prevent knees deteriorating quickly include:Low impact sports like swimming, cycling and walkingReducing weight and maintaining a healthy dietArthroscopy of the Knee: Patient InformationPlease stop taking Aspirin and Anti-inflammatory medications 5 days prior to your surgery. You can continue taking all your other routine medication. If you smoke you are advised to stop a few days prior to your surgery.You will be admitted on the day of surgery and need to remain fasted for 6 hours prior to the procedure.The limb undergoing the procedure will be marked and identified prior to the anesthetic being administered.Once you are under anesthetic, the knee is prepared in a sterile fashion. A tourniquet is placed around the thigh to allow a ‘blood – free' procedure.The Arthroscope is introduced through a small (size of a pen) incision on the outer side of the knee. A second incision on the inner side of the knee is made to introduce the instruments that allow examination of the joint and treatment of the problem.Post-operative RecoveryYou will be taken to your roomA bandage will be around the operated knee.Once you are recovered your IV will be removed and you will be shown a few exercises to do.Your Surgeon will see you prior to discharge and explain the findings of the operation and what was done during surgery.Pain medication will be provided and should be taken as directedYou can remove the bandage in 24 hours and place waterproof dressings (provided) over the wounds.It is NORMAL for the knee to swell after the surgery. Elevating the leg when you are seated and placing ice packs on the knee will help to reduce swelling. (Ice packs on for 20 min 3-4 times a day until swelling has reduced)You are able t return to work when comfortable unless otherwise instructed.Appointment given 7-10 days after surgery to monitor your progress and remove the 2 stitches in your knee at 15 day post operative.Risks of ArthroscopyPost –Operative Exercises and Physical TherapyFollowing your surgery you will be given an instruction sheet showing exercises that are helpful in speeding up your recovery. Strengthening your thigh muscles (Quadriceps and Hamstrings) is most important. Swimming and cycling (stationary or road) are excellent ways to build these muscles up and improve movement. Arthroscopy of the Knee Joint The arthroscope is a fiber-optic telescope that can be inserted into a joint (commonly the knee, shoulder and ankle) to evaluate and treat a number of conditions. A camera is attached to the arthroscope and the picture is visualized on a TV monitor. Most arthroscopic surgery is performed as day surgery and is usually done under general anesthesia. Knee arthroscopy is common, and millions of procedures are performed each year around the world. Arthroscopy is useful in evaluating and treating the following conditions Torn floating cartilage (meniscus): The cartilage is trimmed to a stable rim or occasionally repaired Torn surface (articular) cartilage Removal of loose bodies (cartilage or bone that has broken off) and cysts Reconstruction of the Anterior Cruciate ligament Patello-femoral (knee-cap) disorders Washout of infected knees General diagnostic purposes Basic Knee Anatomy The knee is the largest joint in the body. The knee joint is made up of the femur, tibia and patella (knee cap). All these bones are lined with articular (surface) cartilage. This articular cartilage acts like a shock absorber and allows a smooth low friction surface for the knee to move on. Between the tibia and femur lie two floating cartilages called menisci. The medial (inner) meniscus and the lateral (outer) meniscus rest on the tibial surface cartilage and are mobile. The menisci also act as shock absorbers and stabilizers. The knee is stabilized by ligaments that are both in and outside the joint. The medial and lateral collateral ligaments support the knee from excessive side-to-side movement. The (internal) anterior and posterior cruciate ligaments support the knee from buckling and giving way. The knee joint is surrounded by a capsule (envelope) that produces a small amount of synovial (lubrication) fluid to help with smooth motion. Thigh muscles are important secondary knee stabilizers. Investigations A routine X-Ray of the knee, which includes a standing weight-bearing view is usually required. An MRI scan which looks at the cartilages and soft tissues may be needed if the diagnosis is unclear. There is little value in the use of Ultrasound in investigating knee problems. Meniscal Cartilage Tears Following a twisting type of injury the medial (or lateral) meniscus can tear. This results either from a sporting injury or may occur from a simple twisting injury when getting out of a chair or standing from a squatting position. Our cartilages become a little brittle as we get older and therefore can tear a little easier. The symptoms of a torn cartilage include Pain over the torn area i.e. inner or outer side of the knee Knee swelling Reduced motion Locking if the cartilage gets caught between the femur a tibia Cartilage Tears Once a meniscal cartilage has torn it will not heal unless it is a very small tear that is near the capsule of the joint. Once the cartilage has torn it predisposes the knee to develop osteoarthritis (wear and tear) in 15 to 20 years. It is better to remove torn pieces from the knee if the knee is symptomatic. Torn cartilages in general continue to cause symptoms of discomfort, pain and swelling until the loose, ragged pieces are removed. Only the torn section is removed and the knee should recover and become symptom free. If the entire meniscus is removed, the knee will develop osteoarthritis in 15 to 20 years. It is standard to remove only the torn section of cartilage in the hope that this will delay the onset of long-term wear and tear osteoarthritis. Occasionally, provided the knee is stable and the tear is a certain type of tear in a young patient (peripheral bucket handle tear), the meniscus may be suitable for repair. If repaired, one has to avoid sports for a minimum of three months. Articular Cartilage (Surface) Injury If the surface cartilage is torn, this is most significant as a major shock-absorbing function is compromised. Large pieces of articular cartilage can float in the knee (sometimes with bone attached) and this causes locking of the joint and can cause further deterioration due to the loose bodies floating around the knee causing further wear and tear. Most surface cartilage wear will ultimately lead to osteoarthritis. Mechanical symptoms of pain and swelling due to cartilage peeling off can be helped with arthroscopic surgery. The surgery smoothes the edges of the surface cartilage and removes loose bodies. Anterior Cruciate Ligament Injuries Rupture of the Anterior (rarely the posterior) Cruciate Ligament (ACL) is a common sporting injury. Once ruptured the ACL does not heal and usually causes knee instability and the inability to return to normal sporting activities. An ACL reconstruction is required and a new ligament is fashioned to replace the ruptured ligament. 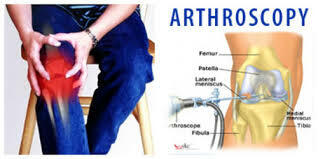 This procedure is performed using the arthroscope. Patella (knee-cap) Disorders The arthroscope can be used to treat problems relating to kneecap disorders, particularly mal-tracking and significant surface cartilage tears. Patients may need to stay overnight if a lateral release has been performed as knee swelling is quite common. The majority of common kneecap problems can be treated with physical therapy and rehabilitation. Inflammatory Arthritis Occasionally arthroscopy is used in inflammatory conditions (e.g. Rheumatoid Arthritis) to help reduce the amount of inflamed synovium (joint lining) that is producing excess joint fluid. This procedure is called a synovectomy. After the surgery a drain is inserted into the knee and patients generally require one or two nights in hospital. Bakers Cysts Bakers cysts or popliteal cysts are often found on clinical examination and ultrasound / MRI scan. The cyst is a fluid filled cavity behind the knee and in adults arises from a torn meniscus or worn articular cartilage in the knee. These cysts usually do not require removal as treating the cause (torn knee cartilage) will in most cases reduce the size of the cyst. Occasionally the cysts rupture and can cause calf pain. The cysts are not dangerous and do not require treatment if the knee is asymptomatic. New Technology Isolated areas of articular cartilage loss can be repaired using cartilage transplant technology. This is a new and exciting field that is developing in the treatment of specific isolated cartilage defects in younger patients The process is called Autologous Chondrocyte Grafting . It involves harvesting cartilage cells from the affected knee, sending these cells to a laboratory and then culturing the cells to multiply into many cells. The large amount of cells produced are then placed back into the affected knee into the defect requiring resurfacing. Results are still short-term follow-up but are looking encouraging. After a major cartilage or ligament injury has been treated the knee can return to normal function. There is however a small increase in the risk of developing long-term wear and tear (Osteoarthritis) and depending on the degree of injury activity modification may be required. Activities that help prevent knees deteriorating quickly include: Low impact sports like swimming, cycling and walking Reducing weight and maintaining a healthy diet Arthroscopy of the Knee: Patient Information Please stop taking Aspirin and Anti-inflammatory medications 5 days prior to your surgery. You can continue taking all your other routine medication. If you smoke you are advised to stop a few days prior to your surgery. You will be admitted on the day of surgery and need to remain fasted for 6 hours prior to the procedure. The limb undergoing the procedure will be marked and identified prior to the anesthetic being administered. Once you are under anesthetic, the knee is prepared in a sterile fashion. A tourniquet is placed around the thigh to allow a ‘blood – free' procedure. The Arthroscope is introduced through a small (size of a pen) incision on the outer side of the knee. A second incision on the inner side of the knee is made to introduce the instruments that allow examination of the joint and treatment of the problem. Post-operative Recovery You will be taken to your room A bandage will be around the operated knee. Once you are recovered your IV will be removed and you will be shown a few exercises to do. Your Surgeon will see you prior to discharge and explain the findings of the operation and what was done during surgery. Pain medication will be provided and should be taken as directed You can remove the bandage in 24 hours and place waterproof dressings (provided) over the wounds. It is NORMAL for the knee to swell after the surgery. Elevating the leg when you are seated and placing ice packs on the knee will help to reduce swelling. (Ice packs on for 20 min 3-4 times a day until swelling has reduced) You are able t return to work when comfortable unless otherwise instructed. Appointment given 7-10 days after surgery to monitor your progress and remove the 2 stitches in your knee at 15 day post operative. Risks of Arthroscopy Post –Operative Exercises and Physical Therapy Following your surgery you will be given an instruction sheet showing exercises that are helpful in speeding up your recovery. Strengthening your thigh muscles (Quadriceps and Hamstrings) is most important. Swimming and cycling (stationary or road) are excellent ways to build these muscles up and improve movement.